In spiritual development one of the first things people often develop are some sort of psychic senses. These skills are developed through meditations, energy work, and other exercises often outlined in texts. Many times psychic development is also the first step in developing the skills to practice other forms of magic. There are many tools to aid in psychic development. There are many different herbs that can be worked with to create incenses, powders, tinctures, and other charms and tools to help one strengthen their psychic senses. The herbs in this kit have been hand chosen to help the novice psychic create incenses and other tools to open the paths to the psychic and spiritual realms. The herbs in this kit can also aid in astral travel and spirit work outside of the physical body. These techniques are other forms of psychic development and psychic work. These herbs can also aid in shamanic trance work. By aiding in all forms of psychic work from divination to meditation, to astral travel and trance work these herbs also work as powerful aids in spiritual development. By working on and developing your skills psychically you can develop relationships with spirits. You can interact with spirits and Gods. Through these psychic skills and spiritual developments your connection with the universe around you and the mysteries will grow and you will become a more complete and whole person. 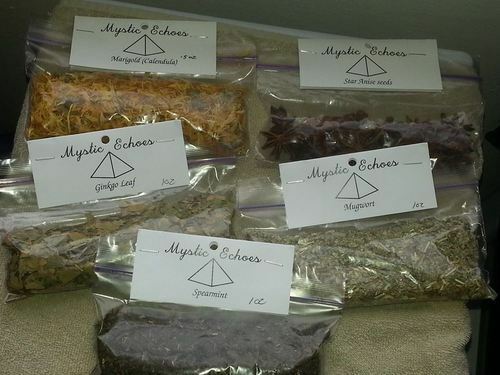 Posted on April 3, 2014, in Herb, Herbal Magic, Herbal, incense, spell and ritual kits, Mystic Echoes, Mystic Echoes Products, Psychic and Spiritual development kit, Psychic Development, Psychic Development, spell and tagged Beginner herbalism, Herbal Magic, Herbal starter sets, herbalism, psychic developmen, Spell kits, spiritual developement, Witchcraft. Bookmark the permalink. 2 Comments. this sector ddo not realize this. You should proceed your writing.